You may think you have no business stepping foot inside a Restoration Hardware because of the store’s mind-bending prices. But if you know a few hacks and tips to shopping at the store, you need not pay full price for anything at Restoration Hardware. Ever. Here’s how to find rustic, designer RH pieces for a fraction of the cost. Spring Bed and Bath Event: Save 20-50% off bedroom furniture, bath hardware, linens and all other bed and bath items. Typically around the first day of Spring. Friends and Family Event: Save 20% off everything. Usually the week before Thanksgiving. The New Year Event: Save 25-75% off everything. First week of January. Restoration Hardware also runs promotions on specific categories, such as 60% off lighting, 20% off outdoor furniture or 50% off rugs. Keep an eye out for coupon codes on sites like RetailMeNot.com. Or even call your local store to ask about upcoming promotions. You can also sign up for their email list to be notified of the next sale. To make room for new stock every six months or so, each Restoration Hardware store sells their floor models at 60% off. If you’re in the market for an item displayed in-store such as a couch or lamp, your best possible chance to score a deep discount is to be get your name on the floor model sell-off list. You’re likely not the only one who hopes to walk away with a deeply discounted ottoman, so if you live close to several stores, it’s worth a phone call to each one to try to get dibs. Restoration Hardware rarely offers free shipping promos online. But when you place your order in the store, certain items ship free. The free shipping doesn’t apply to big pieces like furniture and lighting, but smaller items such as hardware, towels and some bedding ship free. No matter how you place your order, you can’t avoid shipping costs for furniture and lighting. The good news: Restoration Hardware has a flat $199 shipping fee for these items. It doesn’t matter how heavy each piece is or how large your order is. So it’s wise to place one giant order and just pay for shipping once. If you use it wisely, the RH Credit Card can help you stretch your budget for large purchases. For the first year you have the card, you’ll benefit from two great perks: No minimum payments and no interest. So you could splurge on decorating your bedroom, then chip away at the total throughout the year. Warning: Be careful here. If you don’t pay off the card’s balance within that first year, the interest rate jumps from 0% to a whopping 25% on your remaining balance. All cardholders also get access to the RH Reward program. For every $500 you spend, you’ll get a $25 Restoration Hardware gift certificate. While this might not be as lucrative as some other credit card rewards programs, this is a good option if you already plan to spend a lot at the store. Restoration Hardware sends all their damaged items to one of their 17 outlets across the United States and Canada. Their qualifications for “damaged” can be liberal — it can mean a missing tag, a microscopic cushion tear or small nick. RH outlet stores do not ship or place items on hold, so you’ll have to show up in person to survey the goods, then buy on the spot. 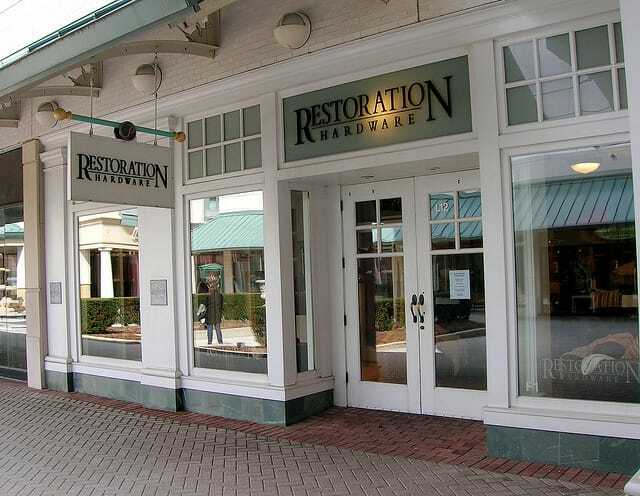 Restoration Hardware has several outlets in California, as well as locations in Colorado, Florida, Georgia, Massachusetts, Missouri, New York, Pennsylvania, Texas, Virginia, Washington, Wisconsin and Canada. See the full list to find the closest outlet near you. You can also sign up to get outlet-specific emails to be the first to know about special promotions. Search Craigslist to buy pieces off people who are moving or upgrading to new furniture. Score the best deals towards the end of the month, when people who are moving are eager to clean out their places. Find knock-offs at a range of big box stores, from Target to Pier One to World Market. There’s even a Restoration Hardware Lookalikes Facebook group, so you don’t have to spend time scouring the web to find those look-alikes. If you’re particularly crafty or handy, get that distressed RH look with a bit of elbow grease and creativity. Check out this Restoration Hardware DIY Pinterest board for ideas, and then try making your own furniture. We hope these tips will help you score that Restoration Hardware statement piece — or at least find one that looks like it came from Restoration Hardware — to make all your friends jealous. Your Turn: What’s the most you’ve saved at Restoration Hardware? How’d you do it? Betsy Mikel is a Chicago-based freelance copywriter. She loves biking all over every city she visits to find its best taqueria.